He was baptized on 18 February 1822 in Holy Cross Church, Ramsbury, Wiltshire, England . Thomas Fuller was born the first of eleven children to Richard and Sophia (nee Marchant) Fuller. Thomas was baptised in the Holy Cross Church, Ramsbury on 18 February 1822. Mary Ann Hobbs is the daughter of Charles and Elizabeth Hobbs and was born in Froxfield Wiltshire, being baptised there on 16 December 1827. The 1851 Census for Ramsbury has both Mary Ann and Richard living at the same address in Back Lane and lists their occupation as ‘Labourer’. They were most probably employed by one of the landowners who operating grazing land abutting the Lane. On the 22 September 1851 Thomas and Mary Ann were married by Vicar J. Hawkins in the Holy Cross Church, Ramsbury. Both marked the register using an ‘X’. Thomas and Mary Ann’s first two children were born in Ramsbury; Ellen Sophia being born on the 9 December 1851 and Jane being born around 1853, being baptised on 14 August 1853.There is no doubt that the life of an agricultural labourer was difficult, particularly in the mid part of the 19th Century. Many left their place of employment for the machine shops of the larger cities. In her book, ‘The Village in the Valley – A History of Ramsbury’, Barbara Croucher indicates a general rural depopulation, beginning in 1841. It appears that Thomas and Mary Ann chose to be part of this departure but sought a better life in South Australia. On the 4 May 1854 they and their two children were aboard the "Navarino" when it left Southampton for the trip to Port Adelaide. The ship was a 464 ton, 3 mast barque, its dimensions being 123’ x 29’ 4” x 7’, mastered by Captain T. Storey. Thomas and Mary Ann were accompanied on this trip by Mary Ann’s younger brother William and his wife Mary Ann (nee Dance). Daughter Jane contracted convulsions whilst on the journey to Australia and on 13 July 1854 she died and was buried at sea. The ship arrived at Port Adelaide on the 14 August 1854. Thomas, Mary Ann and Ellen went to Melrose where they settled at Wild Dog Creek, which at this time was part of the ‘Charlton’ station owned by Samuel White. It was in 1840 that the explorer Edward John Eyre named Mt Remarkable. However, it was only 3 years later that the pastoralists established themselves in the area. In 1846 a Special Survey of 20,000 acres was granted to the Mount Remarkable Mining Company for the purpose of mining copper. However this venture was not successful and the Company was dissolved in 1851. Old Melrose was surveyed by T. F. Nott in 1853 as part of his duties for the Mount Remarkable Mining Company's subdivision of the Special Survey. What is known as the township of Melrose today is really the aggregation of the Police Paddock (1848), Old Melrose (1853) and New Melrose (1856). As pastoralists, miners and timber-getters moved into the area, so the tradesmen came to fill their needs. Melrose was the only established town in this area for more than twenty years and it developed as the "Emporium of the North" supplying remote pastoral runs, mining camps and early settlers with goods, communication and transport. In January 1858 Charles Brown Fisher took over the lease and in 1861 renamed the run ‘Wirrabara’. Nine other children were born of Thomas and Mary Ann. Son George died on 3 February 1862 and was buried in Paradise Square, an early burial ground across the road from what is now the National Trust Museum. The recoverable remains from this cemetery were later removed to the current cemetery. However, there is no record of George in the new cemetery so it possible that he is still interred in Paradise Square. In March 1880 Thomas Fuller junior enrolled at the Melrose Public School being enrolment number 40. At the time of his enrolment his father Thomas was listed as being that of a labourer in Melrose living 2 miles from the school. The teacher was Walter Earl. On 7 September 1883 Thomas left the school. Mary Ann died on 7 June 1888 and is buried in the Melrose Cemetery. In 1886-87 South Australia celebrated its golden jubilee, but the satisfaction was tinged with gloom. By 1890 the colony had experienced several years of economic depression, which was to last until after 1900. It was relieved for some of the colonists by the success of South Australian investors and workers in the rich, new silver-lead mines at Broken Hill. This probably explained why a number of our ancestors moved away from Melrose and settled there. 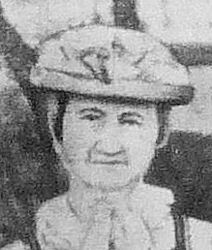 She died on Sunday, 26 June 1932, aged 69 years, 4 months and 25 days, in Robert St, Norseman, Western Australia .